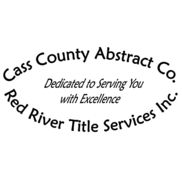 Cass County Abstract Company/Red River Title Services is honored to have served our customers for over 100 years. We take our jobs seriously. When investing in a new home, a new site for your business, or any piece of property, you need to have peace of mind that the property is truly yours. Rely upon our expertise and our quality staff to help make your real estate transaction a truly satisfying experience. Our abstract/title research company serves the counties of Cass County, North Dakota, and Clay County, Minnesota.